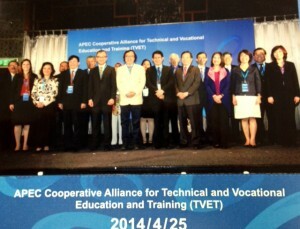 Last week, I had the honor as serving as a delegate at a conference held by the Asian-Pacific Economic Cooperative (APEC) Alliance for Technical and Vocational Education and Training in Taipei, Taiwan. Along with education and government leaders from Taiwan, the Philippines, Malaysia, Thailand, Japan, Korea andÂ Vietnam. 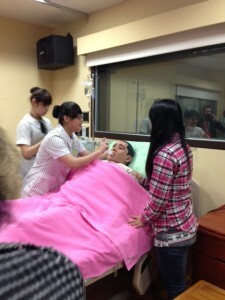 This event was co-hosted by Taiwan’s Ministries of Labor and Education and Taipei Tech University. One thing that struck me was the similarity in our challenges and the goalsÂ of our CTE/vocational education and training systems. Nearly every leader spoke of high youth/young adult unemployment, an aging population, the disconnect between what students are learning in school and the skills demanded in the workforce, and the need to upskill our systems. Other countries are also struggling with raising the image of CTE – the representative from Thailand, for example, noted that they refer to this challenge as “3D” in thatÂ the jobs are considered “dangerous, difficult and dirty.” While the language and solutions might vary across countries, the role of CTE as a driver of economic development and vitality wasÂ something we all had in common. CGUST, on the other hand, is a private four-year institution that provides training for health care professionals through its College of Nursing and College of Human Ecology. This campus featuresÂ state-of-the-art simulation equipment, an on-site kindergarten class run by students and staffed by nurses (who also happen to be instructors), and one of the highest placement rates for its graduates. 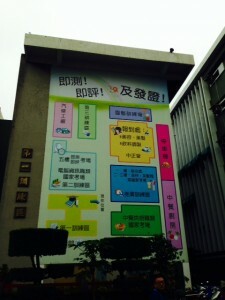 Â All students participate in professional internships during summer breaks and about 87% pass their professional certification, which is twice Taiwan’s national average. All in all, the trip was an eye-opening experience that brought our own CTE system – andÂ its strengths and ongoingÂ challenges – into focus. This entry was posted on Tuesday, April 29th, 2014 at 11:12 am	and is filed under Uncategorized. You can follow any responses to this entry through the RSS 2.0 feed. Both comments and pings are currently closed.